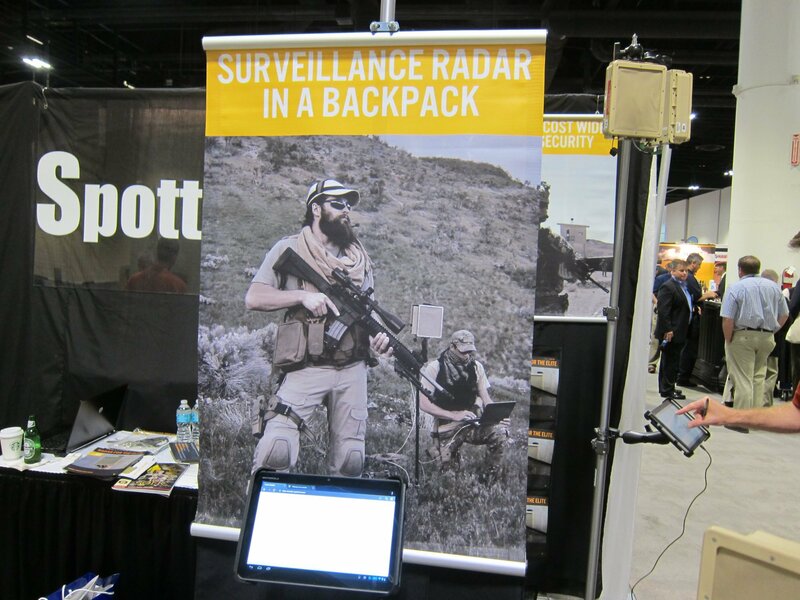 SpotterRF Radar Backpack Kit (or “Backpack Radar Kit”): Compact, Lightweight Backpackable/Manpackable Ground Moving Target Indicator (GMTI) Motion-Tracking Perimeter Surveillance Radar (PSR) System for Military Special Operations Forces (SOF) Perimeter Security and Force Protection Applications (SOFIC 2012 Demo Video!) | DefenseReview.com (DR): An online tactical technology and military defense technology magazine with particular focus on the latest and greatest tactical firearms news (tactical gun news), tactical gear news and tactical shooting news. DefenseReview (DR) has been watching the excellent Hatfields & McCoys mini-series on the History Channel this week, and boy could the Hatfields have used this system, particularly against that malevolent savage "Bad" Frank Phillips' posse. 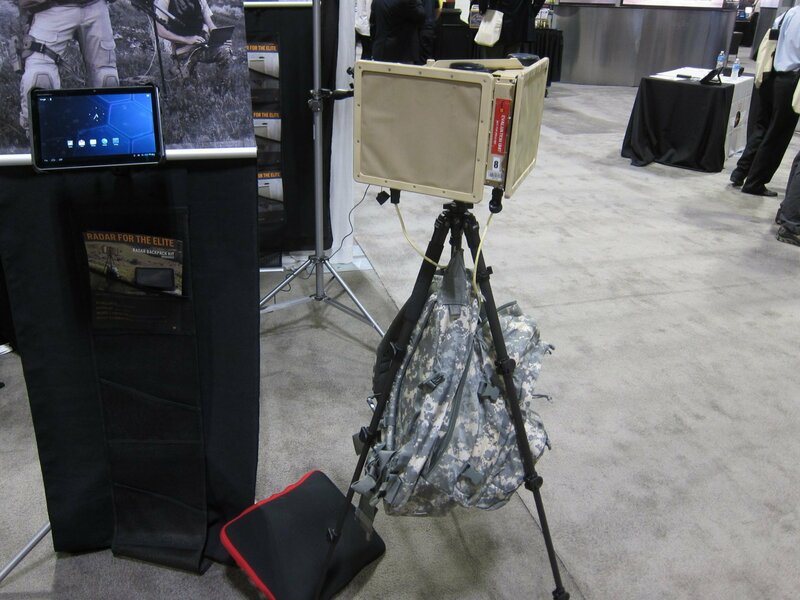 The SpotterRF Radar Backpack Kit (or "Backpack Radar Kit") perimeter surveillance radar (PSR) system is compact, lightweight and obviously backkpackable/manpackable, and is just what the doctor ordered when your Special Operations Forces (SOF) team is in need of some manpackable automated perimeter security augmentation. DR actually first discovered SpotterRF mini surveillance radar (ground moving target indicator motion-tracking radar) while we were sharing a shuttle van ride from the hotel to the venue (exhibition hall) with SpotterRF CEO Logan Harris during SOFIC 2010 (Special Operations Forces Industry Conference 2010). Logan pulled what DR believes was a SpotterRF M600C GMTI radar sensor panel out of a case and handed it to me. I remember thinking "well, this is very interesting!". 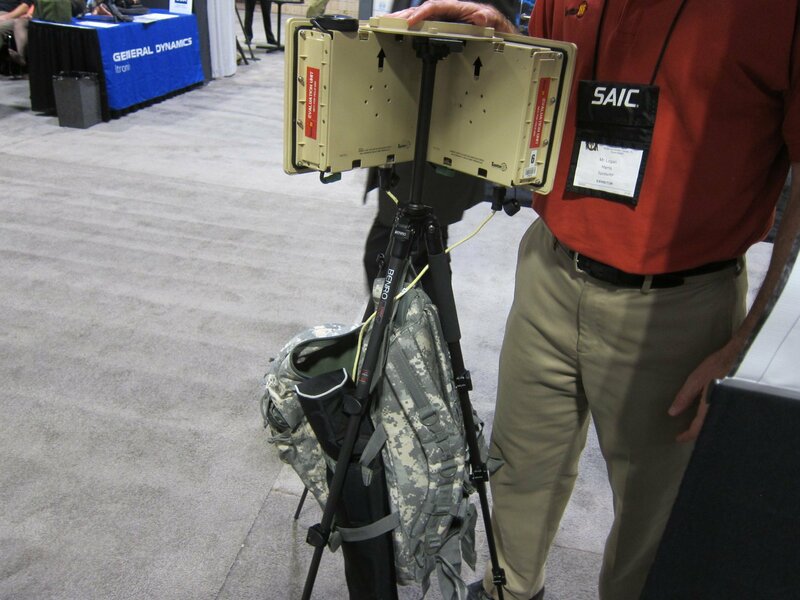 We then saw the hardware/technology again at SOFIC 2011. For some reason, we never wrote about it. It would seem that it somehow just dropped off our radar. Sorry, that was bad. But seriously, we should have written about it in 2010 right after the show, because it's very cool and would seem to be a very important piece of tactical hardware/tech. So, two years later, here we are post SOFIC 2012 with the skinny. 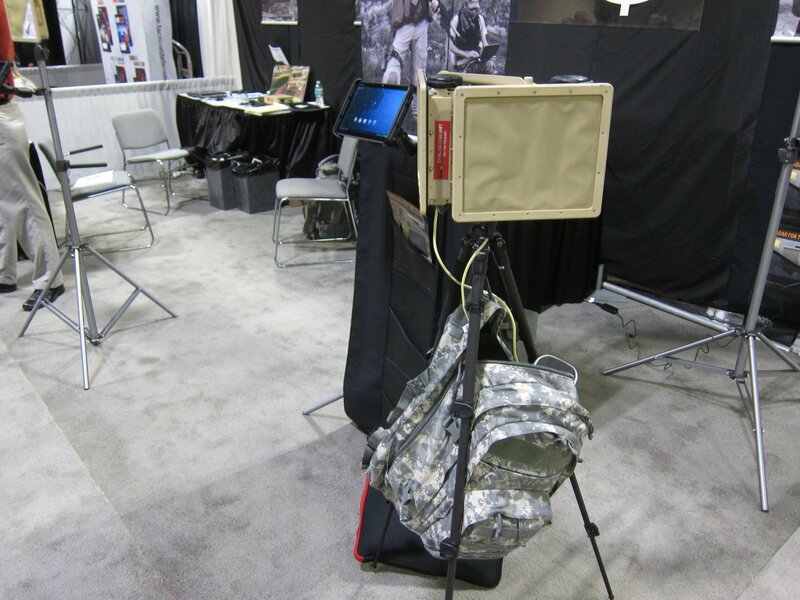 Getting right to it, when infantry force protection is the game, the SpotterRF Radar Backpack Kit PSR system is definitely one of the names to seriously contemplate, as it will help you identify infiltrating baddies as quickly and as far away as possible, giving your SOF team more time and distance to react to the threat. When it comes to military force protection, time is often life, and life is obviously precious, so why screw around? The sooner you can detect, identify and track the threat, the sooner you can either engage it or exfil the area. Defense Review isn't recommending that you only use SpotterRF perimeter surveillance radar system of course. DR also likes sophisticated, high-end surveillance camera systems, rapid-deployable remote wireless unmanned ground sensor (UGS) systems, mobile ballistic fighting positions, monofilament and laser trip wires, you name it, but SpotterRF lightweight surveillance radar certainly makes a nice entree in your perimeter security buffet/smorgasbord, especially since you can backpack it. Since you can backpack either the 3lb (3-pound) SpotterRF M80 lightweight radar surveillance system or 4lb (4-pound) SpotterRF M600C compact radar surveillance system, the M600C gives you twice the effective detection range with minimal increase in size and weight. The only question is how much more does it cost? We'll try to find out. 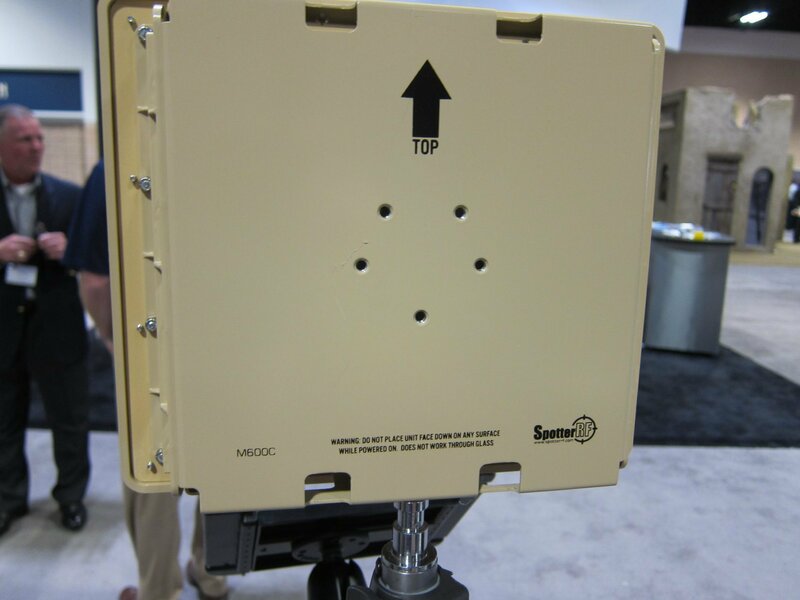 The M80 is the worlds lightest man portable radar available. Designed for use in high clutter environments, this radar is perfectly suited for perimeter security of high value facilities near urban locations. It is easily integrated with surveillance cameras to augment any security system with wide area situational awareness. – Lightest surveillance radar in the world—3 lbs. – Integrates with Cue cameras to provide live imagery of moving targets. – Tracks a walker out to 500m. – Minimal training required to operate (30-60 minutes in field). – Integrates with FalconView, Google Earth and RaptorX. – For perimeter security FOBs, or areas near urban environments. Size: 6.8" x 8.4" x 2.6"
Lightwieght Radar Surveillance Outside the Wire. The M600C is a warfighter's dream come true. It provides wide-area all-weather situational awareness that is reliable and simple to use. It's compact size and light weight make it easy to pack several into a rucksack and carry to any location. – Saves lives by detecting possible threats day or night through snow, rain, fog or sand. – Capable of tracking a walker moving anywhere within 150 Acres. – Low weight (4lb), and low power consumption. – For surveillance protection of VSO, COPs, FOBs, or borders. – Cues cameras to provide live imagery of moving targets. – 5 Minutes setup from pack to track using a simple web UI setup. Size: 10.125" x 8.75" x 2.25"
"SpotterRF, the leader in Micro Surveillance Radar, is bringing tracking radar from the age of the mainframe into the age of personal computers by applying the latest in wireless RF components, high speed processors and web networking technology to achieve a revolutionary decrease in size, weight and power consumption and at the same time improve the ease of use of wide area Ground Surveillance Radar (GSR). The SpotterRF M600, weighs less than 5 lbs., is about the size of a shoebox, has no moving parts and yet is able to track a moving person anywhere within a 148 acre area. The M600 is an ideal force protection sensor for small unit operations because it can detect and track people on foot up to 3000 feet away at night, during the day, through fog and in all types of weather giving warfighters unparalleled situational awareness in the "War on Terror." The M600 is so simple and easy to use that training can be done in 15 minutes in the field and requires only a web browser like Internet Explorer and Google Earth for real time visualization. Because the M600 is small and flexible, multiple units can be used together simultaneously to provide full 360 degree coverage or spaced out to adapt to the terrain. It is very common for small units to find themselves in rugged terrain where a 360 degree field of view is not possible. They could be up on a ridge with a cliff on one side, trees on the other and they need to put one sensor beyond the trees and another looking down a canyon. 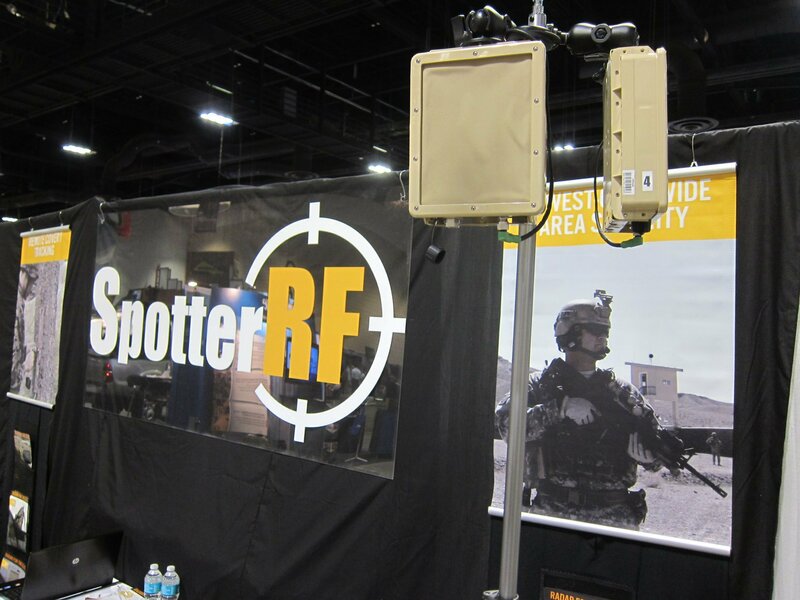 SpotterRF fits between the short range (<;;100m) Unattended Ground Sensors (UGS) and the long range Ground Surveillance Radars that can weigh 100 lbs or more. Typical GSR have ranges of 10km on tracking people but have rotating heads that reduce reliability, and require highly trained operators to setup and maintain. SpotterRF is more like an IP camera with its web user interface and interface directly into Google Earth. 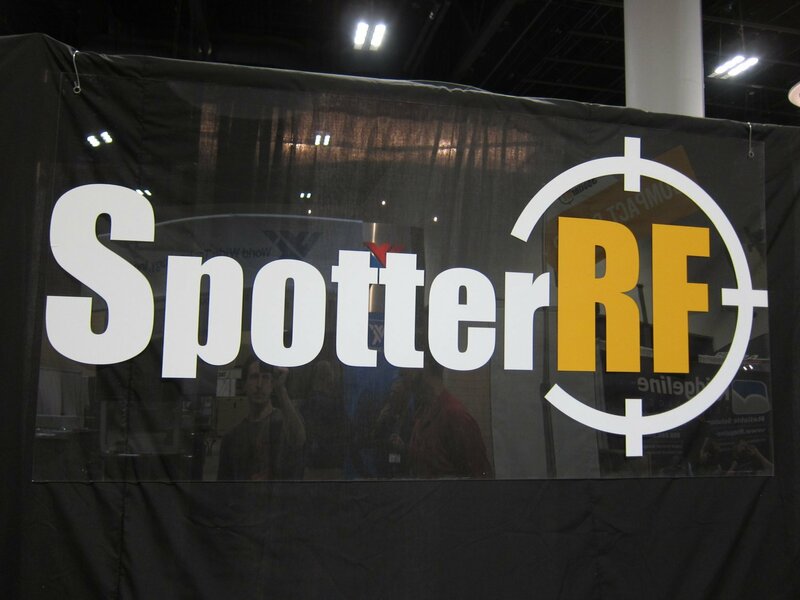 The SpotterRF measures range and angle to the target and using its GPS position automatically calculates the targets GPS coordinates. It is like sticking a GPS tracker on an uncooperative target. SpotterRF can also communicate using Cursor On Target (COT) a XML based protocol developed for DoD that is supported by Falconview and a wide range of common operational picture software."